← Wristbands on the way! Chicken is a popular choice for people with digestive problems, because from what I gather it generally doesn’t cause problems. As I’ve said before everyone is different, so you might be fine with chicken or it might be a no go for you. I certainly eat a fair amount of chicken, and I am often looking around for new recipes to make my diet a little more varied. This is one that I have done a fair few times and really enjoy. Obviously if you are cooking for other people then just increase the quantities. I normally serve this with plain rice (shown here) or egg noodles. So to start: I get a saucepan and put it on to boil for the rice or noodles. I then get the stock prepared as per instructions, then add the honey, lemon juice and soy sauce. Once this is done I put the oil into a deep pan and heat it on the hob. While this is heating up I dice the chicken into lumps about 1 inch square and coat it with the flour. I then fry it in the oil until its cooked through and golden brown on the outside. Sometimes I need to add a little more oil, just keep an eye on if its looking too dry add a little more. This is probably a good time to put the rice or noodles on to cook as well – just double check the instructions on the packet. While the chicken is cooking I slice the pepper up. If pepper is a no-go for you then just leave it out. You can add different veg if that works better for you, or just leave it out altogether. Once the chicken is cooked through, I add the peppers, then after a few minutes the stock and let it all cook together for 5, minutes. Once this is done then I drain the rice or noodles and serve the chicken. And that’s it! Hope you enjoy this one guys. 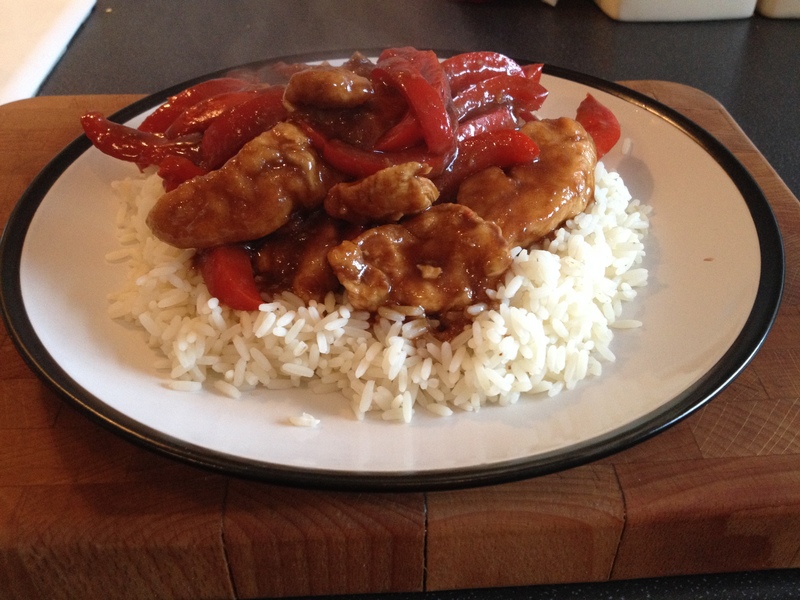 This entry was posted in Recipes and tagged Chicken recipe, Sticky lemon chicken. Bookmark the permalink.